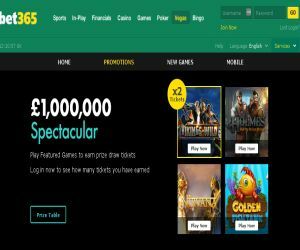 Lord Bingo News Gaming Industry bet365’s £1,000,000 Spectacular! The holidays are coming, and it's the most magical time of year! So celebrate the holidays in style with bet365's £1,000,000 Spectacular promotion! With bet365's show-stopping promotion, you can take your shot at becoming a millionaire, just in time to watch the ball drop and party into the New Year! The scorching offer runs across bet365's star-studded brands, including Games, Casino and Vegas until 1st January 2017. Over the next few weeks, bet365 will host a total of 8 prize draws. So you'll have more than enough spectacular chances to win your share of of 60,000 bonuses! How to get in on the action! To get in on the winning action, you can check the schedule and play special featured games each week. Each time you wager just £10 staked on one of the qualifying games, you can earn yourself a ticket to the glamorous prize draw. To up the ante, you can also play one of the Double Ticket Games, to earn two tickets to the dazzling draw. The highlight is that there are no ticket restrictions. So you can earn an unlimited amount of tickets, to boost your chances of taking home a star-studded prize. You can also dive into the action on your desktop, and on the go on your mobile and tablet. Just make sure you check the schedule! So you can find out where and when you have to be, to bring in the New Year in spectacular style!